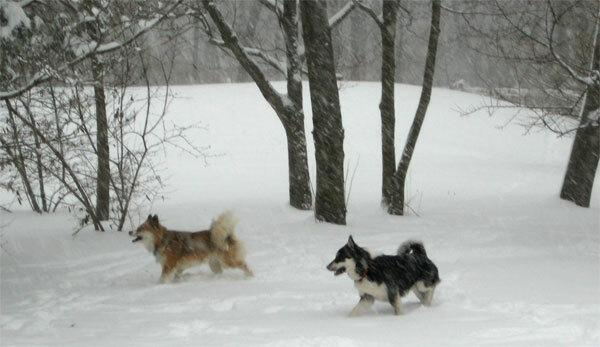 This blog is mostly about our Icelandic Sheepdogs, with a smattering of family news. Also see our Stonecrop Icelandic Sheepdog website. We are lifetime members of the Icelandic Sheepdog Association of America, which is the official AKC club for the breed. Please visit their website (link on the right) for lots of information about Icies. The name of the blog refers to our pottery studio. I also have a genealogy website. I was browsing in a mall shop that had pottery and thought of you. Congratulations on how well the dogs performed. I have relocated to Maryland for the past three years. When i can i still skate, but not as often as i wish. Please drop an email sometime. I left my work because by the time i am home i don’t bother going on line. Hope the year brings prosperity and peace. Hello Holly- I saw your post on the Icelandic e-mail list, and thought I would look up your site. Your dogs are beautiful My daughter Katelyn and I have one Icie from Frelsi Farms. Katelyn wanted her very own puppy and Elaine had a litter that was ready to go home right at the end of the school year last year. I had heard good things about Elaine from a few breeders. I love your site and how it lists many rescources. What a great idea!